"It’s so easy to use compared to swaddling. The two-way zip is so handy. Kuba instantly slept better, he was snug yet free to kick around in his dreams." 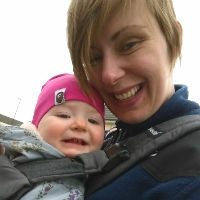 "The two-way zip is brilliant for night time nappy changes. It’s great for keeping him warm & snug whilst we’re changing him." "It’s such a brilliant design compared to others. It’s more fitted around the upper body meaning it doesn’t ride & bulk up. It’s really improved our nights." "This swaddle turns into a sleeping bag at the snap of a popper. It's a great 2-in-1 product, which we love here at KIDLY." Swaddle them when they're tiny, keep them warm and cosy as they get older with just one product. Yup, we've got the heart eyes too. The ergoCocoon 'no origami' baby Swaddle Sleep Bags are super easy to use - no skill in wrapping needed here - thanks to the simple zip up design. And they're made to stop lil' Houdini's from escaping too. When they're used to being in the big wide world, just pop the button and turn this lil' miracle into a 2.5 TOG sleep bag. Designed for winter temperatures, it's made from an Organic Cotton jersey outer layer and is filled with 100% organic cotton for warmth. Perfect.